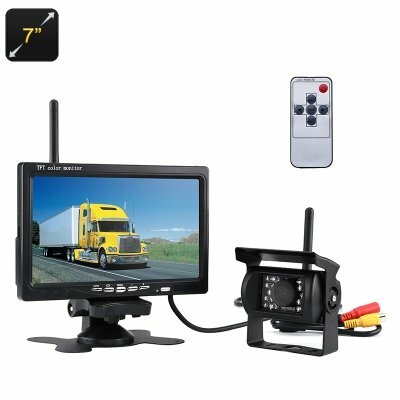 Successfully Added Rearview Parking Camera - 7-Inch Display, 2.4G Wireless Connection, Nightvision, Waterproof, 120-Degree Lens, 800x480p to your Shopping Cart. With this rearview parking camera, you’ll never bump into an obstacle again while parking your truck. The parking cam comes with a 7-Inch wireless car monitor that can be efficiently placed on your dashboard. Thanks to the 2.4G wireless connection between your camera and display; you’ll be able to see all that’s happening behind your car. Its wireless design makes this car accessory easy to install without the need of connecting any external cables. From now on, you’ll be able to safely park your car with the minimum amount of effort. The included parking camera features a durable and waterproof design. It comes with a metal casing and lens protector to ensure it won’t get accidentally damaged during your trips. Thanks to this, you’ll be able to use this parking camera in the roughest of terrains and environments. With a 120-degree wide-angle lens, you’ll be provided with a clear overview of all that happens behind your car. Not a single obstacle will stay hidden with this parking cam in place. The 7-Inch display provides you with clear images in an 800x440p resolution of all that your camera records. It has been crafted out of durable and stylish black ABS material which makes it a great car accessory to pimp up your ride. The camera itself has been equipped with 16IR LEDs. Thanks to this, you’ll be able to enjoy clear and detailed images on your display at both day and night. No matter the time of the day, from now on you’ll always be able to easily park your truck and monitor what’s happening behind your vehicle. This car parking camera comes with a 12 months warranty, brought to you by the leader in electronic devices as well as wholesale electronic gadgets..